Advances in contact lens technology have given us numerous options to choose from which can make finding the right contact lenses confusing and overwhelming. The optometrists at Maple Ridge are here to help! First, you should know that contact lenses are can be categorized by several characteristics. Daily wear contact lenses are prescribed to be worn during the day and for a maximum of 18 hours. Daily wear contact lenses must be removed at night. They require nightly cleaning and disinfection. They should also be cleaned and disinfected after each removal. Extended wear contact lenses can be worn overnight for up to six nights. Extended wear lenses typically have a higher water content and are thinner, which allows for more oxygen to reach the eye. However, these contact lenses are known to have a higher incident of eye problems and should only be worn upon the recommendation of your optometrist in Maple Ridge. Follow the recommended disinfecting guidelines or discard after using. Contact lenses are prescribed on a schedule based on your needs. Planned or Frequent Replacement contacts are disposable and replaced with a new pair. These lenses may be replaced quarterly, monthly, 1-2 weeks or daily depending on the recommendation of your eye doctor. Planned replacement lenses require disinfection after each use unless they are daily disposables. Daily disposables are only used once and then discarded. Conventional lenses known as unplanned replacement lenses are not replaced and can be used up to 12 months as long as they remain undamaged. Contact lenses may be categorized by the refractive error they are designed to correct. Spherical contact lenses are used for myopia or nearsightedness as well as hypermetropia or farsightedness. Toric contact lenses are used for astigmatism. Bifocal contact lenses are used for presbyopia which is the loss of ability to focus on reading or other close up activities. In some cases, presbyopia may be treated by a system known as monovision. Monovision is where one eye is fitted with a distance lens while the other is fitted for a reading lens. 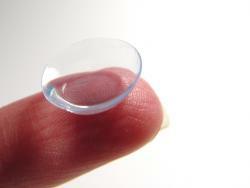 About two-thirds of patients use this form of contact lenses. Contact lenses can be clear or tinted. Tint is used for therapeutic or cosmetic purposes. There are three types of tinted contact lenses available. Cosmetic enhancements which are translucent and are designed to enhance natural eye color. They are recommended for people with light-colored eyes (blue, green, light hazel or gray). Opaque or "cosmetic" tint are used to change your eye color whether they are dark or light. The pattern on the lens overlies the colored portion of your eye and gives the color a natural look. Visibility tints are pale, but have just enough color so that you can see the lenses when holding them. They typically have no effect on eye color. Are you ready to try contact lenses? Schedule an appointment with an optometrist in Maple Ridge. We look forward to meeting all your eye care needs.